NABI SALEH, West Bank (RNS) — Bassem and Nariman Tamimi’s squat but expansive one-story home of stucco and tile sits near the highest point of the dusty hilltop village of Nabi Saleh, in the Palestinian West Bank. Bassem Tamini was born here in 1967, a few weeks before the Six-Day War and the subsequent Israeli occupation. In the years since the home has become a symbol of Palestinian resistance to Israeli rule. Most weeks for the past decade, the Tamimis have protested what they say are encroachments on their land by a nearby Israeli settlement and the demolition of their village’s property by Israeli security forces. Palestinian demonstrators run from tear gas fired by Israeli troops during clashes following a demonstration in support of Palestinian prisoners in Nabi Saleh near the West Bank city of Ramallah, on Jan. 13, 2018. (AP Photo/Majdi Mohammed)These are often violent events, as Nabi Saleh has grown into a flashpoint for Palestinian nationalist passions. 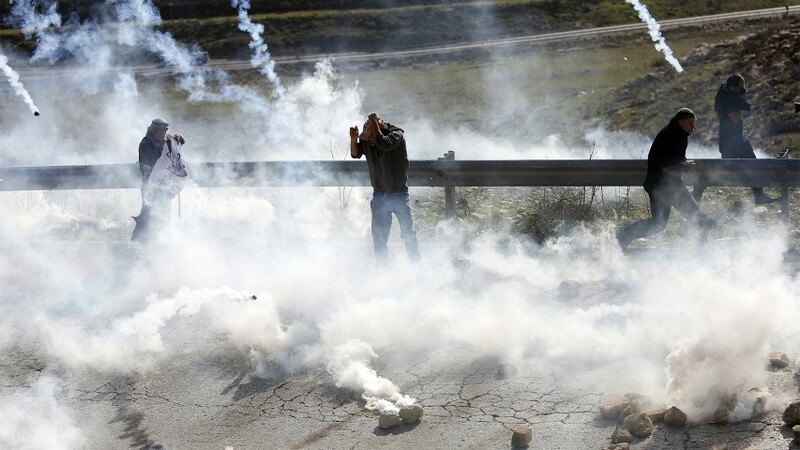 The protests have developed into a form of high-stakes political theater, with activists and photographers surrounding stone-throwing teenagers to document their clashes with the Israeli troops who inevitably arrive. Members of the Tamimi family frequently end up in custody, injured or worse. They also appear on the news. Depending on one’s view of the larger Israeli–Palestinian conflict, the Tamimis are either heroes of the populist Palestinian liberation movement or the epitome of reckless incitement and exploitive propaganda. Palestinian Bassem Tamimi speaks in front of posters showing his daughter Ahed at his home in Nabi Saleh near the West Bank city of Ramallah, on Jan. 5, 2018. Israel’s hard-charging prosecution of his 16-year-old daughter who slapped two Israeli soldiers has trained a spotlight on her activist family and its role in what Palestinians call “popular resistance,” or near-weekly protests against Israeli occupation staged in several West Bank villages. (AP Photo/Majdi Mohammed)Nabi Saleh is the last place one might expect to find a group of evangelical Christians, a demographic known in Israel–Palestine for its enthusiastic support for Israel. But on this hot spring day, two busloads of evangelicals, mostly American, sit sweating in a semicircle among the scraggly olive trees in front of the Tamimis’ house. The cohort was bused here as part of Christ at the Checkpoint, a five-day gathering of Western Christians organized by the West Bank’s tiny evangelical community. In its fifth iteration since 2010, the gathering brings hundreds of Western evangelicals to the town of Beit Jala for field trips and lectures. Attendees learn about the Palestinian narrative and the biblical and theological arguments against faith-based support for the Jewish state. Evangelical tourism to the Holy Land is hardly unusual. 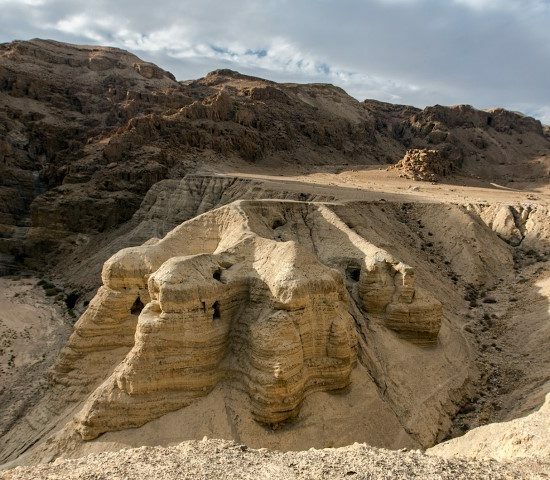 An estimated 100,000 evangelical tourists traveled to Israel last year to walk in the footsteps of Jesus. Many come to see where the Bible prophesies say the end of days will occur. Yet travel into the Palestinian territories is usually limited to day trips to the Church of the Nativity in Bethlehem and a cordoned-off baptismal site on the Jordan River. Buses of Christian tourists are waved quickly through checkpoints, and exposure to the military occupation, and to Palestinians themselves, is almost nonexistent. 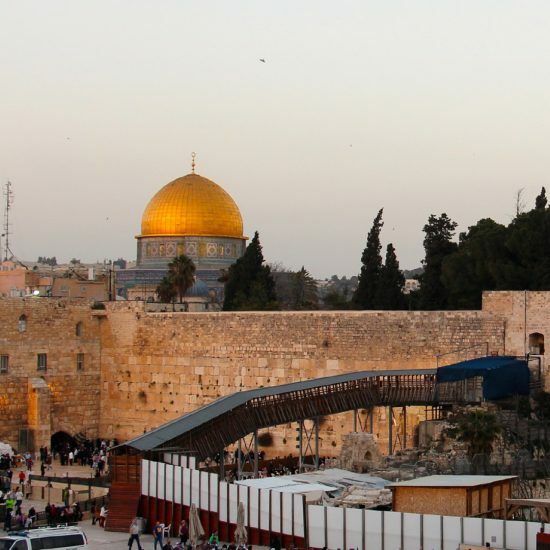 Many evangelical tours of Israel are explicitly designed to foster the bond between Christians and Jews, and to maintain evangelical support for Israel that has such significant influence in U.S. foreign policy. 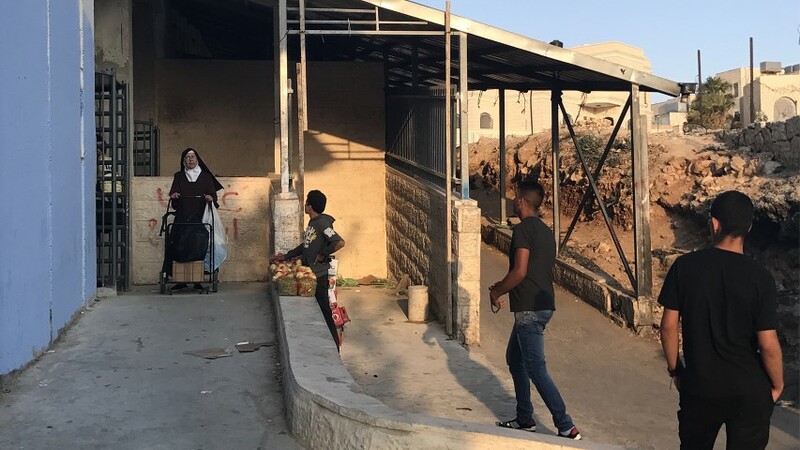 To find a group of evangelicals, many with conservative political beliefs, sipping coffee and Fanta orange soda with a self-described “freedom fighter” in a remote West Bank village is, to say the least, unusual. Bassem Tamimi, a Muslim, looks on quizzically as the group raises their hands in prayer. 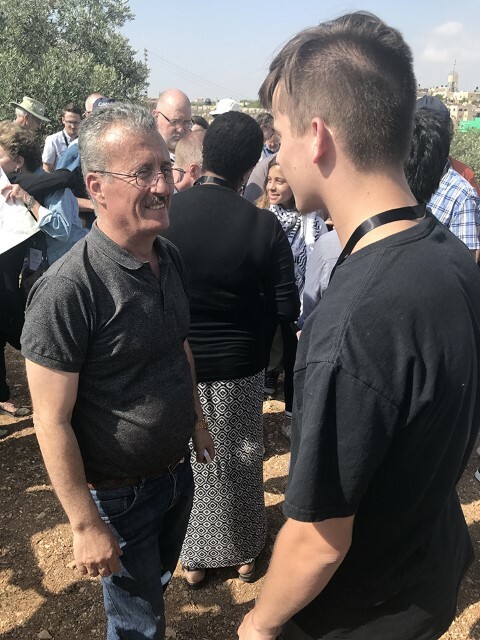 Bassem Tamimi, left, talks with American evangelicals visiting his home in Nabi Saleh, West Bank, on May 29, 2018. RNS photo by Dan RabbThe group listens as the patriarch tells them about the price his family has paid for their activism. His 17-year-old daughter, Ahed, is serving a prison sentence for slapping an Israeli soldier. His cousin was killed when a tear gas canister struck him, and his brother-in-law died of a gunshot wound from an Israeli soldier. He and his wife have been placed in Israeli detention many times for charges ranging from unauthorized protests to assaulting soldiers. He does not, however, mention his cousin Ahlem Tamimi, who was convicted of masterminding a 2001 bombing of a pizza parlor that killed 15 Israelis. While the Christians on the buses seem comfortable with being called “evangelical,” they are far from monolithic in their views. Among the group is a college student in an Industrial Workers of the World T-shirt, a Palestinian keffiyeh wrapped around his neck, who tearfully apologizes to Tamimi for the United States’ role in the region. As the coach winds its way back to Beit Jala, Paul Penley, 38, mostly stares out the window, his sharp features pursed in thought. Wiry and well-groomed, he looks like he could be a policeman or a megachurch preacher. In a way he’s both: the divinity school graduate from Colorado Springs makes his living investigating the integrity of faith-based nonprofits for major donors. While the Christians on the buses seem comfortable with being called “evangelical,” they are far from monolithic in their views. Among the group is a college student in an Industrial Workers of the World T-shirt, a Palestinian keffiyeh wrapped around his neck, who tearfully apologizes to Tamimi for the United States’ role in the region. Moments later, another person asks Tamimi how he can be mad at Israel when Palestine Liberation Organization leader Yasser Arafat refused multiple offers for peace. The bus crosses back through a checkpoint into Bethlehem. Along with the adjacent villages of Beit Sahour and Beit Jala, Bethlehem used to be a primarily Christian enclave, but non-Muslims now make up less than a third of the area’s population. Evangelicals, already a tiny minority among the mainly Orthodox and Catholic Christian population, have dwindled to a few families. They are counted in the hundreds, not thousands. Whether the decline is due to the hardships of Israeli occupation or oppression at the hands of Muslims depends on who you ask. Most Palestinian evangelicals insist that limited economic opportunity and travel restrictions created by Israeli control drive their high rates of emigration. A nun walks through the Hebron Road Checkpoint in Bethlehem, West Bank, on June 5, 2018. RNS photo by Dan RabbMany in the community say they feel forgotten in the conversation around Israel-Palestine, typically framed as being simply between Jews and Muslims. But the prominent role of their American co-religionists in lobbying for Israel, however, has created a unique opportunity for advocacy, if the Palestinians can counter the theological roots of that support. For many of the American visitors in Beit Jala, however, the lectures and workshops they sat through, most disputing the theology that lies at the heart of evangelical Zionism, felt off target. Many of the more conservative Americans on hand say they came to witness the conflict firsthand, to better understand the Palestinian perspective. Many recall their surprise at learning that there were Palestinian Christians who shared their Bible-centric beliefs. They say that many of their experiences in the Holy Land humanized the Palestinian people for them, but that the focus on refuting their theology only served to push them away. The lectures may also result in their missing the conflict they’ve come to see. As this group met, Hamas launched its largest barrage of rocket fire since 2014, Israel responded with airstrikes, and a full-scale war seemed possible. No one at Christ at the Checkpoint, sequestered in conference rooms at Bethlehem Bible College, had any idea of what was happening 50 miles away. Nathan Berg, 44, looks dejected as he slumps in the lobby outside the conference hall. “I came here to stand with my Palestinian brothers and sisters in Christ,” he said. 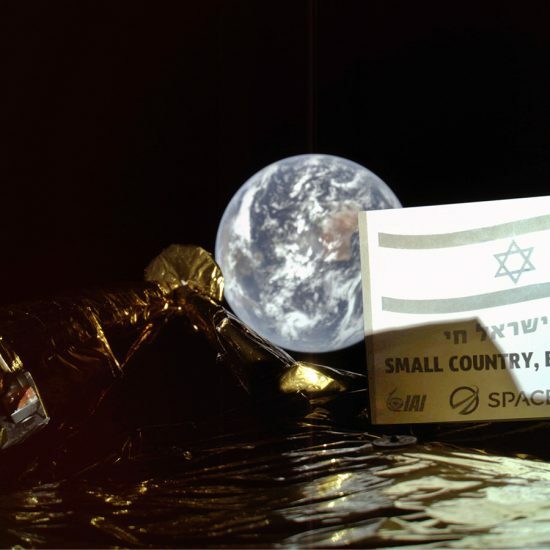 Berg believes in a literal translation of Scripture — that the earth is only a few thousand years old and that Israel is the fulfillment of biblical prophecy. Seeing the realities of life in the West Bank on a previous trip to the Holy Land made him an advocate for Palestinians, a fact he does not see as mutually exclusive to his Christian Zionism. He says he sees no reason why his biblical interpretation and his empathy have to conflict. Yet he is pained by what he perceives as personal rejection because of his belief. Note: This article has been modified. An earlier version included a different description of a person who questioned a Palestinian resister.